I am the kind of person who always looking forward to what the future may be. I like to see and predict things, also aside from doing so I am a very keen observant to my family, friends as well as my surroundings. One thing I ensure to get is the item I want for my son’s costume. I know that Halloween is quite too far from now, however, it was the perfect timing for my son’s view as his birthday falls on the month of February. Therefore, he doesn’t need to wait until Halloween to wear his costume as he can wear it on his Special day, as the themed he picked is the Super Mario Brothers. The shipment was fast; I never thought to receive the product to review right away. It was quite impressive; it gives me more time to see through the costumes if there were defects, and so far, everything is all right. I found Mario’s Brother costume at Wholesalehalloweencustome.com where I have two options of the type they carry. As for my son’s choice, I choose the Kids Deluxe Super Mario Luigi Costume, as it’s my son’s favorite character. The wholesale price is only $27.90, which comes with the complete accessories. There are Super Mario facts to know about the famous Super Mario Brothers. This is a good way to know what else you need in case; your kid decides to have this theme. The products are quite impressive; the linens of the costumes are very-well sewed. The accessory that comes with it is also magnificent; the hands were too big for my 4 years old, though, so that didn’t work for him. The fake mustache just cracks me up whenever my son put them on, somewhat what I need to comprehend the whole Luigi Character. The size of Small which is for 4-6 toddler also fits my son only longer, but works great, and overall there is no problems occurs during the time I received the product to the minute my son runs around with the suit. If you need costumes or party supplies the best place to visit is http://www.wholesalehalloweencustome.com to see the different varieties they have online. You’ll also enjoy the discounts they always have online, so if you need to shop visits them first. A disclaimer: This is NOT a sponsored post. I received the SUPER MARIO DELUXE LUIGI COSTUME products for free in exchange of my honesty review. The outlook I expressed is 100% exclusively mine. OMG! 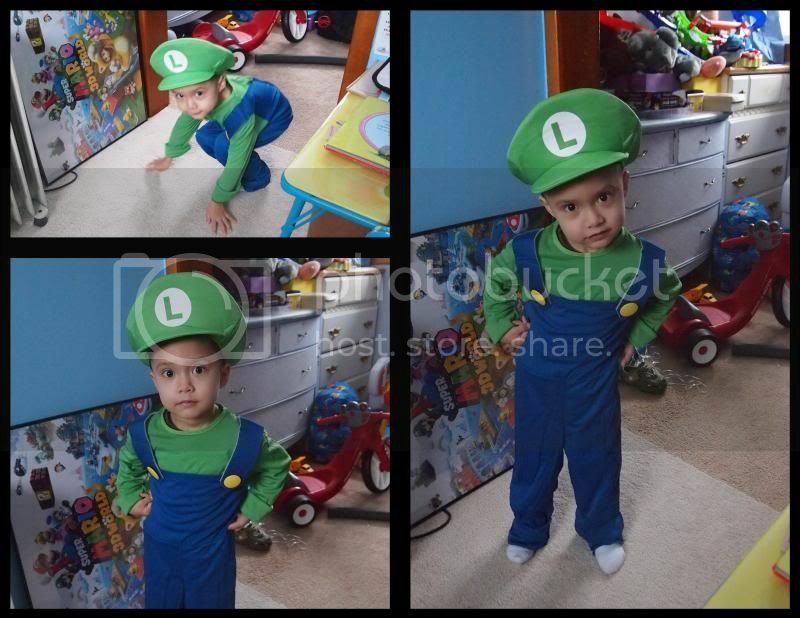 He does look like Luigi, so cute on his costume! Thank you..he love Luigi and of course green color too. The cutest Super Mario ever hehehe. Your baby looks absolutely adorable in this costume. I like how high quality the costume looks. That is so cute! I can't wait to have mine for my kids. Adorable! This would be a good outfit to wear during Halloween because it looks thick enough.